The inspiration I had to compile this information and to present it as a book was birthed from reading Hebrews 6:1-3 in the Amplified Bible. The writer of Hebrews compels his readers to go past what he considers to be “The elementary stage in the teachings and doctrine of Christ (the Messiah).” Interestingly, when you read on the writer tells the reader, “Let us not again be laying the foundation.” He then goes on to give a list of the fundamental doctrines that we should already have set as our foundation to build upon, so we can move to more advanced teaching. As I looked at this list, I asked my congregation what they believed the resurrection from the dead, eternal judgment and punishment is, and what it means to them. I was surprised at how many different interpretations and opinions this small group of believers had on these subjects. So I threw in another one and asked them what they thought about the topic of the Rapture. Again I was very surprised by the differing mindsets and opinions on this topic as well. I concluded that I needed to cover these subjects thoroughly so that we all had a firm foundation established, being of the same mind and spirit. It is only then that we can advance to more spiritual teachings and grow to maturity. After teaching these sessions, everyone in our congregation said I needed to put them in a book and get these truths out to the world. The Resurrection from the dead and judgment are considered basic doctrines of the church, something you build upon. However, I believe most Christians are “Bible ignorant” of the facts given to us on these core subjects. There are many theories and fantasies about both subjects. The aim of this book is to bring your understanding and expectations of these topics in line with what the Bible clearly says. Speculation outside of Bible knowledge should be clearly recognised as such, “speculation.” Such speculation may ultimately prove to be right in the future but is not to be relied upon or believed as fact for the purpose of building our faith. There are some things concerning God we are not clear on because we have not been given enough information from the Bible, and hence cannot be dogmatic in our point of view or worldview. Allow yourself to receive these revelations with an open heart. Can I suggest you read this whole book before making any of your own conclusions? “Resurrection” means the raising of humanity at the last days! Jesus talked a lot about two future events; the end times and His second coming. By sharing these prophecies with His disciples, Jesus did not encourage them to speculate about the exact time when He would return. Instead, He urged all His followers to be watchful and prepared for His second coming. If we serve Jesus faithfully now, we will be ready for His return. To lay a proper foundation for an understanding of the resurrection and judgement, it is necessary to find out what we are being resurrected from and what we are entering into. Through this process, I will be briefly covering information that will assist in developing the foundation necessary for these key subjects to be settled. What I have endeavoured to do is to whet your appetite to create a desire within you to move on to more advanced teachings. Have a look at the words of Jesus from the book of John chapter sixteen. We notice here that Jesus tells us that He needs to go to the Father for our benefit, and so the world has no excuse available to them because of what Jesus has done; In John 15:22 Jesus said it this way, “If I had not come and spoken to them, they would not be guilty of sin [would be blameless]; but now they have no excuse for their sin.” Then in verse 24 Jesus said; “If I had not done (accomplished) among them the works which no one else ever did, they would not be guilty of sin. But [the fact is] now they have both seen [these works] and have hated both Me and My Father. We are going to look at the nature of death, where one goes following death. What is the difference between Heaven and Hell? We need to realise that there is a different place for Old and New Testament believers to go after they leave this world. Most people don’t even realise that there are different compartments to the location of the place we call Hell. We will then investigate what the Resurrection and Righteousness message are all about, and why they are so significant and necessary for the establishment of faith. What Jesus taught about the resurrection of the dead, what the disciples witnessed, how the Resurrection affects our life today, and what the Resurrection has in store for us in the future. 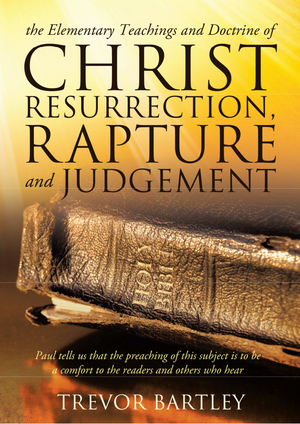 Without the truth of the resurrection message our faith is just another religion with no real substance, the message of the resurrection sets Christianity apart – this book is dedicated to establishing this truth in the heart of every believer. The extent of the work of Christ’s resurrection is staggering. However, if there is one topic that is the ‘central message’ of the Bible, it is the sacrifice of Christ. The Old Testament looks forward to it, whereas the New Testament looks back to it. In the Bible, Jesus only gave us two ordinances that are to be observed, the Lord’s Supper and Baptism, both of which involve Jesus’ death and resurrection. Of the Lord’s Supper, Jesus said: “This cup is the new covenant in my blood; do this, whenever you drink it, in remembrance of me” (1 Corinthians 11:24). Here we have a clear reference to His blood that was shed on the cross. He goes on to say “For every time you eat this bread and drink this cup, you are symbolically proclaiming the fact of the Lord’s death until He comes again,” identifying that He is risen and coming back for us. Then, with baptism, we are to go under the water (representing Jesus’ death), pause (representing Him in the grave), and then come back out of the water (representing His coming back to a new life, His resurrection). We need to remember that the story doesn't end with Jesus’ death. He is currently in Heaven, in His resurrected body, and one day He will return. The resurrection of Jesus was an act of the supreme love of God. Remember our identification is in who we are in Christ and His resurrection. The Bible tells us in John 14:12 that the things Christ has done we can do, and greater than these we will do because He goes to the Father. The resurrection demonstrated Jesus’ victory over the power of death and confirmed there is life beyond the grave. Jesus Christ offers us a "resurrection" power beyond ourselves that can make us alive; it empowers us to overcome the limitations of this realm with an infused ability, as we focus on the Spirit of power working within us. I hope you receive much insight and revelation as you discover the wholeness of what Jesus achieved for you and me in His death and resurrection.